On September 21, 1972, President Ferdinand E. Marcos placed the Philippines under Martial Law, suspending the civil rights and imposing military authority. Congress was also abolished. September 21 is the official date of the declaration but was formally announced on TV and radio live by Mr. Marcos on September 23. Marcos who stayed in office for more than 20 years -- from 1965 to February 1986, explained that martial law was intended to suppress civil strife and the threat of communist takeover following the series of bombings in Manila. During those times, the threat to the country’s security intensified following the re-establishment of the Communist Party of the Philippines (CPP) in 1968. Supporters of CPP’s military arm, the New People’s Army, also grew in number in Tarlac and other parts of the country. The attempt on the life of then Minister of Defense Juan Ponce Enrile gave Marcos a window to declare Martial Law (Enrile would later reveal that the assassination attempt on his life was staged). The President declared the emergency rule the day after the Enrile assassination attempt. Mr. Marcos also declared that the insurgency in the south, caused by the clashes between Muslims and Christians, was a threat to national security. 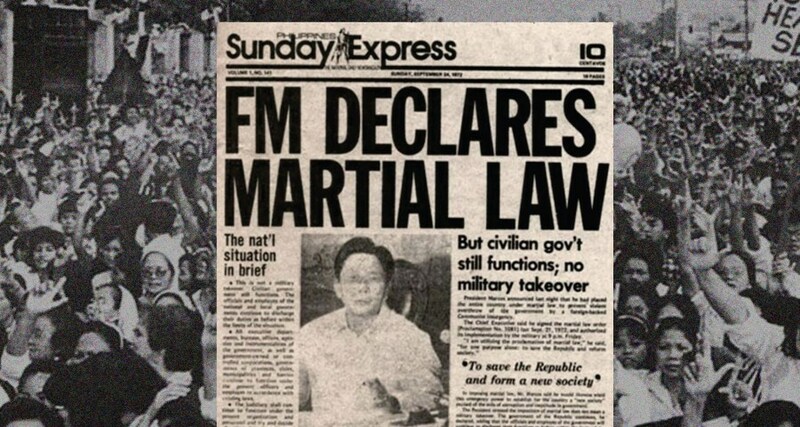 Initially, the imposition of martial law was supported by majority of Filipinos. It was viewed as a change that solved the massive corruption in the country. Gradually, however, martial law became unpopular due to human rights abuses and excesses by the military, not to mention the incarceration of opposition leaders critical of the martial law. Journalists, student leaders and labor activists critical of the Marcos administration were also detained. Numerous media outfits were either closed down or operated under tight control. Businesses owned by the oligarchy were confiscated and were taken over by Marcos' family members and close personal friends, and were allegedly used as fronts to launder proceeds from institutionalized graft and corruption in the different national governmental agencies. Martial law was lifted on Jan. 17, 1981, although the suspension of the privilege of the writ of habeas corpus continued in the autonomous regions of Western Mindanao and Central Mindanao.